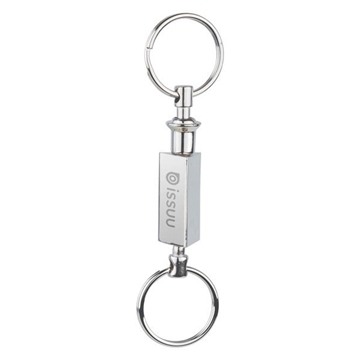 A triangular-shaped, polished chrome metal pull apart key chain. One side detaches from the base, providing great security. I always like ordering with AnyPromo for these things because of the great service I always receive. When they started using it, we've been getting a stream of great feedback! It was definitely a great purchase. Great quality for the price! Variety of colors to choose from. Customer service for AnyPromo has also been really great! Always helpful and very easy to work with. They're lightweight & very stylish! We put our brand on these bars and sell it for fundraising purposes. Very popular because it really tastes good aside from looking professional. They've been perfectly received.